Dilated cardiomyopathy (DCM) refers to dilation and systolic dysfunction of the ventricles (predominantly the left ventricle) with or without congestive cardiac failure. It is the most common form of heart muscle disease in children. See the image below. 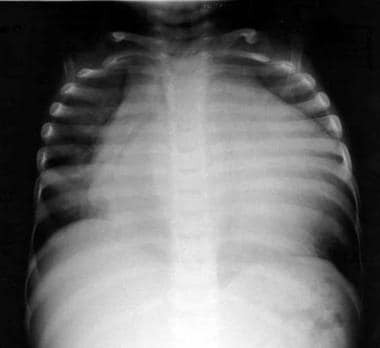 Chest radiograph of a child with idiopathic dilated cardiomyopathy. Onset of DCM is usually insidious but may be acute in as many at 25% of patients. Approximately 50% of patients with DCM have a history of preceding viral illness. Wheezing may be an important clinical sign, suggesting congestive heart failure in infants. Echocardiography and Doppler studies form the basis for the diagnosis of DCM. They are the most informative noninvasive tests for diagnosing the type of cardiomyopathy and the degree of dysfunction in the heart muscle. Chest radiography may reveal cardiomegaly and pulmonary edema. Cardiomegaly that is incidentally detected on a chest radiograph or an arrhythmia that is incidentally detected on an electrocardiogram (ECG) may be the basis for initial cardiac referral. ECG may show the degree of left ventricular enlargement and reveal any abnormal heart rhythm. The complete blood count, erythrocyte sedimentation rate, and C-reactive protein level may show evidence of acute inflammation in patients with DCM in the presence of active myocarditis. First-pass test and multiple gated acquisition (MUGA) scans help to measure the left and right ventricular stroke volumes and cardiac outputs. They are also helpful in documenting dyskinetic segments in the ventricular wall. Invasive procedures such as cardiac catheterization should be performed by experienced pediatric cardiologists and only when absolutely essential. Children with DCM are at a particular risk for complications during cardiac catheterization studies and angiography. At present, preparation for cardiac transplantation and need for myocardial biopsy are the main indications for performing the procedure. Myocardial biopsy is usually performed in preparation for cardiac transplant and post-transplant follow-up monitoring. Initial therapy in DCM is largely directed at the symptoms of the underlying heart failure. Diuretics, angiotensin-converting enzyme (ACE) inhibitors, and beta-blockers are used. Diuretics may provide an improvement in symptoms, whereas ACE inhibitors appear to prolong survival. Beta-blocker therapy in children with chronic heart failure due to DCM has been shown to improve symptoms and left ventricular ejection fraction. Automatic implantable cardioverter-defibrillators (ICDs) reduce sudden death, and their efficacy has been clearly demonstrated in adults with chronic congestive heart failure. However, their use in children has been limited. Cardiac resynchronization therapy with AV synchronous biventricular pacing has been successful in some children with DCM and left bundle branch block (LBBB). Cardiac transplantation is currently the optimal treatment for DCM-induced resistant chronic heart failure in children. Idiopathic dilated cardiomyopathy (DCM) refers to congestive cardiac failure secondary to dilatation and systolic dysfunction (with or without diastolic dysfunction) of the ventricles (predominantly the left ventricle) in the absence of congenital, valvular, or coronary artery disease or any systemic disease known to cause myocardial dysfunction. DCM is the most common type of heart muscle disease in children. All four cardiac chambers are dilated and are sometimes hypertrophied. Dilation is more pronounced than hypertrophy, and the left ventricle is affected more often than the right ventricle. The cardiac valves are intrinsically normal, although the mitral and tricuspid valve rings are dilated, and the valve leaflets do not appose each other in systole, giving rise to varying degrees of mitral regurgitation, tricuspid regurgitation, or both. Persistent mitral regurgitation leads to thickening of the mitral valve leaflets, and, at times, distinguishing this thickening from other causes of mitral regurgitation is difficult. Thrombus formation (secondary to the low-flow cardiac output state) is often seen in the left ventricular apex and, at times, is seen in the atria. Occasionally, the right ventricle is preferentially involved in the cardiomyopathic process; this often indicates a familial basis. Echocardiography and Doppler studies form the basis for the diagnosis of dilated cardiomyopathy (DCM) in most patients (see Workup). Cardiac transplantation is currently the optimal treatment for DCM-induced resistant chronic heart failure in children (see Treatment). Patient education is a continuous process from the time of diagnosis. Explain the disease process, management, and prognosis to parents and older patients. In cases of familial DCM, patients and their families should be told about the genetic implications. For patient education information, see the Heart Center, as well as Heart and Lung Transplant. These compensatory mechanisms help to maintain cardiac output in the initial phase; however, as myocardial damage progresses, persistent and excessive activation can be detrimental to cardiac function, leading to overt congestive heart failure. Over-stretching of the ventricles causes myocardial thinning, cavity dilation, secondary valvular regurgitation, and compromised myocardial perfusion. The resulting subendocardial ischemia perpetuates myocyte damage. Apoptosis (ie, programmed cell death) is now believed to play a role in the continuing loss of myocardial cells in chronic heart failure. Overloading of myocytes possibly triggers apoptosis without fibrosis. Heightened peripheral vasoconstriction, abnormal and excessive remodeling of the peripheral vasculature, and abnormalities in endothelium-dependent vasodilation contribute to the progression of heart failure. Abnormal responses to muscarinic stimulation along with a defect in the endothelial nitric oxide pathway have been suggested as the potential underlying mechanisms. Altered gene expressions resulting in calcium-handling abnormalities, downregulation of myosin or conversion to the less-active beta isoform, and abnormal beta-receptor signal transduction have all been identified at the molecular level in the chronically failing heart. Various factors have been identified as causes of myocardial damage. These are presented in Table 1, below. However, in the vast majority of patients, no specific etiology is demonstrable (ie, idiopathic DCM). Systemic carnitine deficiency and anthracycline-induced cardiomyopathy are notable exceptions. Three major factors have been implicated in the pathogenesis of myocardial damage in DCM: preceding viral myocarditis, autoimmunity, and underlying genetic predisposition. Epidemiologic, serologic, and molecular studies have detected evidence of enteroviral infection, in particular coxsackievirus B, in 20-25% of patients. Evidence also implicates various other viruses. In fact, the most common associated viruses appear to vary over time. [6, 7] Currently, coxsackievirus B is likely a less common cause of DCM than in the past. Currently, no methods can be used to distinguish cardiovirulent strains of enteroviruses from those that are not virulent. Furthermore, the presence of a virus in a patient with DCM does not necessarily establish a causal relationship. Demonstration of viral DNA or RNA by polymerase chain reaction (PCR) is a more reliable method for revealing viral myocarditis. Unfortunately, obtaining myocardial tissue is invasive. Animal studies have shown that DCM is an autoimmune disease in genetically predisposed strains of mice. In humans, approximately 30-40% of adult patients with DCM have organ-specific and disease-specific autoantibodies. The absence of these antibodies in the remaining patients may be related to the stage of disease progression. It has been postulated that an insult such as viral myocarditis initiates an autoimmune process with superantigen-triggered immune responses, resulting in massive T-lymphocyte activation and myocardial damage. Autosomal dominant and recessive inheritance, X-linked transmission, and polygenic and mitochondrial inheritance have all been documented. Presently known DCM genetic loci are summarized in Table 2, below. Mutation screening of the exons that code for actin, β myosin heavy chain (MYH7 gene), cardiac troponin T (TNNT2 gene), phospholamban (PLN gene), titin, αβ-crystallin, and the cardio-specific exon of metavinculin (VCL gene) could be helpful in detecting some forms of familial DCM. Anthracyclines, which are widely used in the management of childhood malignancies, account for as many as 30% of cases of DCM in the United States and a lesser percentage in other countries. Besides DCM, the other manifestations of anthracycline cardiotoxicity include restrictive cardiomyopathy (symptomatic and asymptomatic), cardiac arrhythmias  , asymptomatic left ventricular enlargement, and more subtle changes of cardiac function. Cardiotoxicity has two types: early onset and late onset. The early-onset type may be acute nonprogressive or chronically progressive. Acute-onset type is defined as left ventricular dysfunction during or immediately following infusion of anthracycline and is attenuated by discontinuation of therapy. With use of low-dose regimens, this type is becoming rare. Electrocardiographic (ECG) changes include nonspecific ST segment and T wave changes, decreased QRS voltage, prolonged QT interval, and sinus tachycardia. Less commonly, ventricular, junctional, or supraventricular tachycardia or atrioventricular and bundle branch blocks. Blood levels of cardiac troponin T (cTnT) are a specific marker of this type of injury. Early-onset chronically progressive toxicity presents within one year of completion of therapy and persists or progresses even after discontinuation of therapy. Clinical features are similar to any other type of cardiomyopathy and include ECG changes, left ventricular dysfunction, arrhythmias, reduced exercise-stress capacity, and even overt signs of heart failure. Blood levels of cTnT are elevated. Presence of early-onset cardiotoxicity is believed to be a harbinger of poor patient outcome. Late-onset toxicity clinically manifests after a latent period of one or more years following completion of therapy. This type of manifestation is presumably due to diminished left ventricular contractility and an inappropriately thin left ventricular wall, resulting in elevated wall stress and progressive left ventricular dysfunction. Myocyte loss underlies all these sequelae, and alteration of myocellular protein transcription by anthracyclines may contribute. Thus, the latent period is not latent at all, and more sensitive markers may be able to detect the changes earlier. Late-onset asymptomatic toxicity has also been reported, but more detailed questioning often reveals easy fatigability or dyspnea in many of these patients. In the United States, the reported incidence rate of DCM is 0.57 cases per 100,000 children. The incidence rate in Finland is 2.6 cases per 100,000 children. In the United Kingdom, the incidence rate is 0.87 cases per 100,000 individuals older than 16 years. No reliable figures are available for the rest of the world. Genetic causes account for more than 30% of DCM cases. DCM is reportedly more common in boys than in girls, and some forms are clearly X-linked. All age groups are affected. However, studies suggest that DCM is more common in infants (age < 1 y) than in children. Fetal presentation is uncommon. Approximately one third of patients with DCM die of the disease, one third continue to have chronic heart failure requiring therapy, and one third of patients experience improvement in their condition. Causes of death include heart failure, ventricular arrhythmias, and transplantation-related complications (less common). Children with underlying muscle disorders with progressive dilatation of the heart and worsening heart failure have a worse prognosis compared with patients with idiopathic DCM. If a treatable cause is discovered, prognosis is better. A history of viral illness in the three months before onset may suggest a better prognosis. Prognosis is worst for cardiomyopathy secondary to storage diseases that do not have effective therapy. In DCM with no obvious detectable etiology, outcome depends on severity of myocardial dysfunction, improvement during the first year after onset, compliance with therapy, and availability of timely transplant. Arrhythmic death can occur even after the left ventricular ejection fraction has returned to normal. Following cardiac transplant, survival rates of as much as 77% at 1 year and as much as 65% at 5 years have been reported in children. Akagi T, Benson LN, Lightfoot NE, et al. Natural history of dilated cardiomyopathy in children. Am Heart J. 1991 May. 121(5):1502-6. [Medline]. Andrews RE, Fenton MJ, Ridout DA, Burch M. New-onset heart failure due to heart muscle disease in childhood: a prospective study in the United Kingdom and Ireland. Circulation. 2008 Jan 1. 117(1):79-84. [Medline]. Arola A, Tuominen J, Ruuskanen O, Jokinen E. Idiopathic dilated cardiomyopathy in children: prognostic indicators and outcome. Pediatrics. 1998 Mar. 101(3 Pt 1):369-76. [Medline]. Blauwet LA, Cooper LT. Myocarditis. Prog Cardiovasc Dis. 2010 Jan-Feb. 52(4):274-88. [Medline]. Bowles NE, Ni J, Kearney DL, et al. Detection of viruses in myocardial tissues by polymerase chain reaction. evidence of adenovirus as a common cause of myocarditis in children and adults. J Am Coll Cardiol. 2003 Aug 6. 42(3):466-72. [Medline]. Breinholt JP, Fraser CD, Dreyer WJ, et al. The efficacy of mitral valve surgery in children with dilated cardiomyopathy and severe mitral regurgitation. Pediatr Cardiol. 2008 Jan. 29(1):13-8. [Medline]. [Guideline] Cheitlin MD, Armstrong WF, Aurigemma GP, et al. ACC/AHA/ASE 2003 guideline update for the clinical application of echocardiography: summary article: a report of the American College of Cardiology/American Heart Association Task Force on Practice Guidelines (ACC/AHA/ASE Committee to Update the 1997 Guidelines for the Clinical Application of Echocardiography). Circulation. 2003 Sep 2. 108(9):1146-62. [Medline]. [Full Text]. Chen C, Heusch A, Donner B, Janssen G, Gobel U, Schmidt KG. Present risk of anthracycline or radiation-induced cardiac sequelae following therapy of malignancies in children and adolescents. Klin Padiatr. 2009 May-Jun. 221(3):162-6. [Medline]. Chen SC, Nouri S, Balfour I, Jureidini S, Appleton RS. Clinical profile of congestive cardiomyopathy in children. J Am Coll Cardiol. 1990 Jan. 15(1):189-93. [Medline]. Connuck DM, Sleeper LA, Colan SD, et al. Characteristics and outcomes of cardiomyopathy in children with Duchenne or Becker muscular dystrophy: a comparative study from the Pediatric Cardiomyopathy Registry. Am Heart J. 2008 Jun. 155(6):998-1005. [Medline]. Dimas VV, Denfield SW, Friedman RA, et al. Frequency of cardiac death in children with idiopathic dilated cardiomyopathy. Am J Cardiol. 2009 Dec 1. 104(11):1574-7. [Medline]. Abdallah AM, Carlus SJ, Al-Mazroea AH, et al. Digenic inheritance of LAMA4 and MYH7 mutations in patient with infantile dilated cardiomyopathy. Medicina (Kaunas). 2019 Jan 15. 55(1):[Medline]. [Full Text]. Friedberg MK, Roche SL, Balasingam M, et al. Evaluation of mechanical dyssynchrony in children with idiopathic dilated cardiomyopathy and associated clinical outcomes. Am J Cardiol. 2008 Apr 15. 101(8):1191-5. [Medline]. Fujioka S, Kitaura Y, Ukimura A, et al. Evaluation of viral infection in the myocardium of patients with idiopathic dilated cardiomyopathy. J Am Coll Cardiol. 2000 Nov 15. 36(6):1920-6. [Medline]. Griffin ML, Hernandez A, Martin TC, et al. Dilated cardiomyopathy in infants and children. J Am Coll Cardiol. 1988 Jan. 11(1):139-44. [Medline]. [Guideline] Hershberger RE, Lindenfeld J, Mestroni L, et al, for the Heart Failure Society of America. Genetic evaluation of cardiomyopathy--a Heart Failure Society of America practice guideline. J Card Fail. 2009 Mar. 15(2):83-97. [Medline]. Janousek J, Gebauer RA. Cardiac resynchronization therapy in pediatric and congenital heart disease. Pacing Clin Electrophysiol. 2008 Feb. 31 Suppl 1:S21-3. [Medline]. John JB, Cron SG, Kung GC, Mott AR. Intracardiac thrombi in pediatric patients: presentation profiles and clinical outcomes. Pediatr Cardiol. 2007 May-Jun. 28(3):213-20. [Medline]. Pahl E, Sleeper LA, Canter CE, et al. Incidence of and risk factors for sudden cardiac death in children with dilated cardiomyopathy a report from the pediatric cardiomyopathy registry. J Am Coll Cardiol. 2012 Feb 7. 59(6):607-15. [Medline]. Kaushal S, Jacobs JP, Gossett JG, et al. Innovation in basic science: stem cells and their role in the treatment of paediatric cardiac failure--opportunities and challenges. Cardiol Young. 2009 Nov. 19 Suppl 2:74-84. [Medline]. Kimura A. Molecular etiology and pathogenesis of hereditary cardiomyopathy. Circ J. 2008. 72 Suppl A:A38-48. [Medline]. Kovacevic-Preradovic T, Jenni R, Oechslin EN, Noll G, Seifert B, Attenhofer Jost CH. Isolated left ventricular noncompaction as a cause for heart failure and heart transplantation: a single center experience. Cardiology. 2009. 112(2):158-64. [Medline]. Labombarda F, Blanc J, Pellissier A, et al. Health-e-Child project: mechanical dyssynchrony in children with dilated cardiomyopathy. J Am Soc Echocardiogr. 2009 Nov. 22(11):1289-95. [Medline]. Liu W, Li WM, Sun NL. Relationship between HLA-DQA1 polymorphism and genetic susceptibility to idiopathic dilated cardiomyopathy. Chin Med J (Engl). 2004 Oct. 117(10):1449-52. [Medline]. Malaisrie SC, Pelletier MP, Yun JJ, et al. Pneumatic paracorporeal ventricular assist device in infants and children: initial Stanford experience. J Heart Lung Transplant. 2008 Feb. 27(2):173-7. [Medline]. McMahon CJ, Pignatelli RH, Nagueh SF, et al. Left ventricular non-compaction cardiomyopathy in children: characterisation of clinical status using tissue Doppler-derived indices of left ventricular diastolic relaxation. Heart. 2007 Jun. 93(6):676-81. [Medline]. Michels VV, Driscoll DJ, Miller FA, et al. Progression of familial and non-familial dilated cardiomyopathy: long term follow up. Heart. 2003 Jul. 89(7):757-61. [Medline]. Michels VV, Olson TM, Miller FA, et al. Frequency of development of idiopathic dilated cardiomyopathy among relatives of patients with idiopathic dilated cardiomyopathy. Am J Cardiol. 2003 Jun 1. 91(11):1389-92. [Medline]. Morales DL, Dreyer WJ, Denfield SW, et al. Over two decades of pediatric heart transplantation: how has survival changed?. J Thorac Cardiovasc Surg. 2007 Mar. 133(3):632-9. [Medline]. Norkiene I, Ringaitiene D, Rucinskas K, et al. Intra-aortic balloon counterpulsation in decompensated cardiomyopathy patients: bridge to transplantation or assist device. Interact Cardiovasc Thorac Surg. 2007 Feb. 6(1):66-70. [Medline]. Singh RK, Canter CE, Shi L, et al, for the Pediatric Cardiomyopathy Registry Investigators. Survival without cardiac transplantation among children with dilated cardiomyopathy. J Am Coll Cardiol. 2017 Nov 28. 70(21):2663-73. [Medline]. [Full Text]. Rhee EK, Canter CE, Basile S, Webber SA, Naftel DC. Sudden death prior to pediatric heart transplantation: would implantable defibrillators improve outcome?. J Heart Lung Transplant. 2007 May. 26(5):447-52. [Medline]. Senes M, Erbay AR, Yilmaz FM, et al. Coenzyme Q10 and high-sensitivity C-reactive protein in ischemic and idiopathic dilated cardiomyopathy. Clin Chem Lab Med. 2008. 46(3):382-6. [Medline]. Bonnet D, Berger F, Jokinen E, Kantor PF, Daubeney PEF. Ivabradine in children with dilated cardiomyopathy and symptomatic chronic heart failure. J Am Coll Cardiol. 2017 Sep 5. 70(10):1262-72. [Medline]. [Full Text]. Shaddy RE, Boucek MM, Hsu DT, et al. Carvedilol for children and adolescents with heart failure: a randomized controlled trial. JAMA. 2007 Sep 12. 298(10):1171-9. [Medline]. Singh TP, Sleeper LA, Lipshultz S, et al. Association of left ventricular dilation at listing for heart transplant with postlisting and early posttransplant mortality in children with dilated cardiomyopathy. Circ Heart Fail. 2009 Nov. 2(6):591-8. [Medline]. Sonne C, Sugeng L, Takeuchi M, et al. Real-time 3-dimensional echocardiographic assessment of left ventricular dyssynchrony: pitfalls in patients with dilated cardiomyopathy. JACC Cardiovasc Imaging. 2009 Jul. 2(7):802-12. [Medline]. [Full Text]. Stanton C, Bruce C, Connolly H, et al. Isolated left ventricular noncompaction syndrome. Am J Cardiol. 2009 Oct 15. 104(8):1135-8. [Medline]. Sugiyama H, Hoshiai M, Naitoh A, Kadono T, Suzuki S, Sugita K. Outcome of non-transplant surgical strategy for end-stage dilated cardiomyopathy in young children. Circ J. 2009 Jun. 73(6):1045-8. [Medline]. [Full Text]. Tjang YS, Stenlund H, Tenderich G, et al. Risk factor analysis in pediatric heart transplantation. J Heart Lung Transplant. 2008 Apr. 27(4):408-15. [Medline]. Towbin JA, Lowe AM, Colan SD, et al. Incidence, causes, and outcomes of dilated cardiomyopathy in children. JAMA. 2006 Oct 18. 296(15):1867-76. [Medline]. Koizumi K, Hoshiai M, Toda T, et al. Outcomes of plasma exchange for severe dilated cardiomyopathy in children. Heart Vessels. 2017 Jan. 32(1):61-7. [Medline]. Vatta M, Sinagra G, Brunelli L, Faulkner G. Remodeling of dystrophin and sarcomeric Z-band occurs in pediatric cardiomyopathies: a unifying mechanism for force transmission defect. J Cardiovasc Med (Hagerstown). 2009 Feb. 10(2):149-56. [Medline]. Venugopalan P, Agarwal AK, Akinbami FO. Improved prognosis of heart failure due to idiopathic dilated cardiomyopathy in children. Int J Cardiol. 1998 Jul 1. 65(2):125-8. [Medline]. Venugopalan P, Houston AB, Agarwal AK. The outcome of idiopathic dilated cardiomyopathy and myocarditis in children from the west of Scotland. Int J Cardiol. 2001 Apr. 78(2):135-41. [Medline]. Pillekamp F, Khalil M, Emmel M, Brockmeier K, Hescheler J. Stem cells in pediatric heart failure. Minerva Cardioangiol. 2008 Jun. 56(3):335-48. [Medline]. Alexander PM, Daubeney PE, Nugent AW, et al, for the National Australian Childhood Cardiomyopathy Study. Long-term outcomes of dilated cardiomyopathy diagnosed during childhood: results from a national population-based study of childhood cardiomyopathy. Circulation. 2013 Oct 29. 128(18):2039-46. [Medline]. [Full Text]. Soares P, Rocha G, Pissarra S, et al. Neonatal dilated cardiomyopathy. Rev Port Cardiol. 2017 Mar. 36(3):201-14. [Medline]. [Guideline] Hershberger RE, Givertz MM, Ho CY, et al, for the ACMG Professional Practice and Guidelines Committee. Genetic evaluation of cardiomyopathy: a clinical practice resource of the American College of Medical Genetics and Genomics (ACMG). Genet Med. 2018 Sep. 20(9):899-909. [Medline]. Echocardiogram obtained from apical 4-chamber view revealing a dilated left atrium and left ventricle in a child with idiopathic dilated cardiomyopathy. This is a color Doppler echocardiogram obtained from apical 4-chamber view revealing a dilated left atrium and left ventricle with the blue jet of mitral regurgitation in a child with idiopathic dilated cardiomyopathy. Mild tricuspid regurgitation is also shown. This is an echocardiogram obtained from parasternal long axis view revealing a dilated left atrium and left ventricle in a child with idiopathic dilated cardiomyopathy.